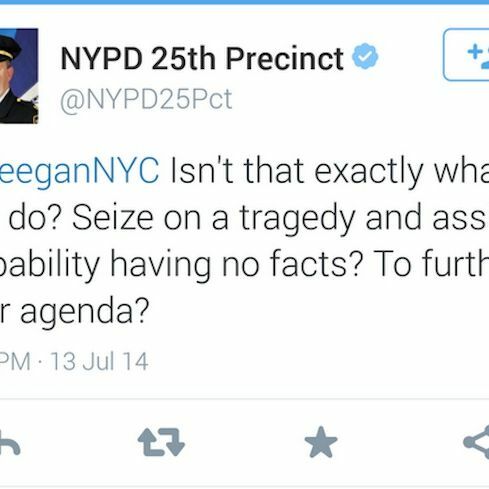 Transportation Alternatives activist Keegan Stephan responded to Harnisch’s jab by calling him out for “using this as an opportunity to criticize our attempts to save lives.” Switching to his work account, Harnisch replied to Stephan with the tweet above: “Isn’t that exactly what you do? Seize on a tragedy and assign culpability having no facts? To further your agenda?” Then he deleted it. Sincere apologies 4 insensitive & unprofessional tweets. Not how I was raised, trained, have served. Will work 2 restore trust/confidence. You could say that this incident demonstrates that the NYPD is still working on getting the hang of Twitter — or you could say it shows that they’re starting to master the medium. After all, what is Twitter for if not getting into public, slightly embarrassing battles with strangers?